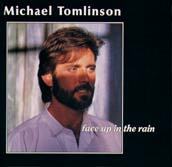 Face Up in the Rain is Michael's third release. His second with major label distribution. Once again he chose Daniel Deardorff as co- producer and though this album featured several sizzling, band-driven songs, there was also a noticeable move toward atmosphere, mood and nature. All is Clear still stands as one of Michael's most popular songs and is constantly on the playlist at his concerts. While there was always a spiritual content to many of the songs, that aspect blossomed on Face Up in the Rain. Particularly on the ethereal ballad, The Way We're Going, and in the love song, Always Warming Me. As was the case on his first two albums, there is an ebb and flow of upbeat, jazzy, folk-rock songs, mixed with softer, story-telling ballads and paeans to love and life.